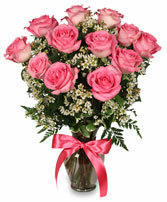 A Dozen Beautiful pink roses arranged in a vase with waxflowers or other nice fill flowers. 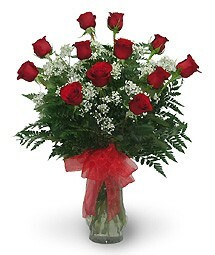 Take her breath away - bring home flowers! Show her your romantic side with this bouquet of lovely lavender roses and dazzling hot pink gerbera daisies. You're sure to find the most beautifully romantic floral arrangements at AUTRY'S 4 SEASONS FLORIST. Come visit The Gallery @ Autry's we are getting well known for all our locally made Art. We have some amazing pieces, such as jewelry, wood, barnwood frames, pottery, organic body care products, candles that smell like cinnamon rolls, and much more.